To do this, we'll take you way back to the beginning of 2010 when Heroki was only about a flying character, collecting items in a prototype environment. Right from the start, we knew we didn't want to make just-another-cute game character, but rather a unique, authentic game character that would be easily recognized. 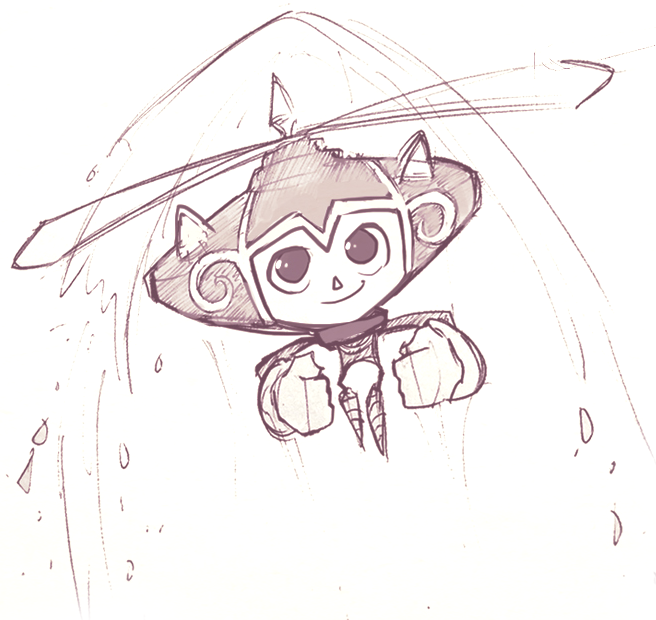 Heroki has a functional design that emphasizes all his abilities. For instance, the idea of picking up and throwing objects came about. 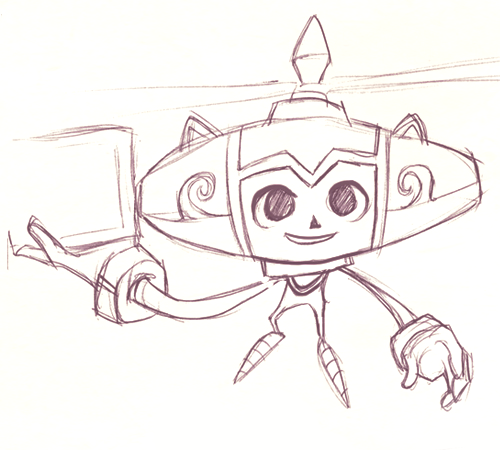 Since this would become a key gameplay feature later on, we felt that we needed to emphasize this in Heroki's design. We knew that the carried object would be placed below his body for readable causes, so in order to not let the object conflict with his body or head, Heroki would need BIG arms. 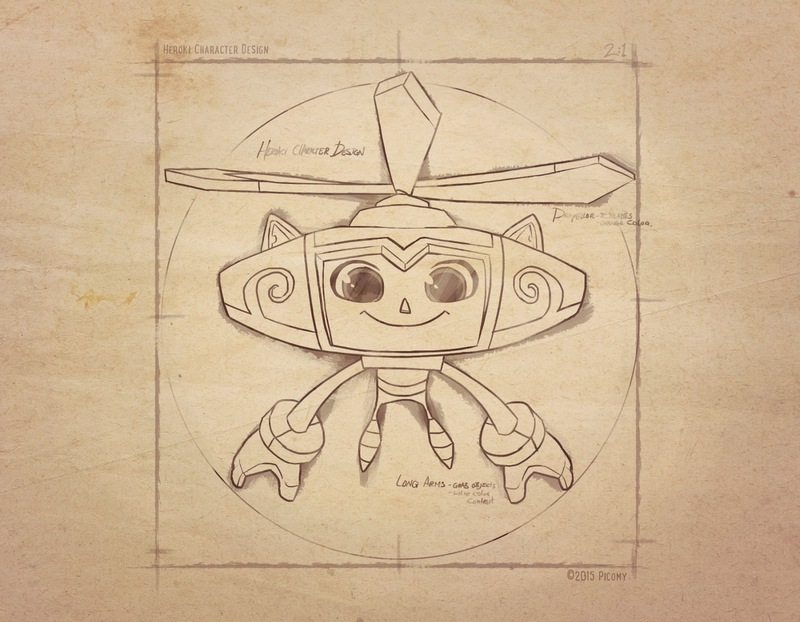 If Heroki would have small arms, the carried object would be placed in front of his body - making it seem like Heroki was an object with a head attached to it so that wouldn't work for obvious reasons. In order to clearly show Heroki's expressions, we decided to make his head 'slightly' bigger so it would be easier to see his emotions on a smaller screen (*Note: At the time, we were developing on an iPhone 3gs 480x320 screen). This is particularly important to emphasize the change of associated gameplay. 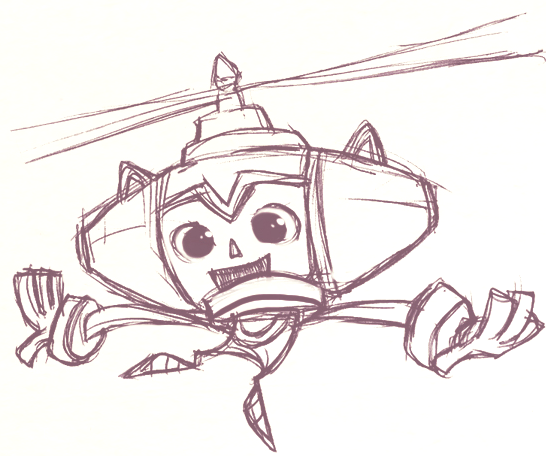 For instance when Heroki gets hurt, he shows an expression that fits that state. Same goes for when Heroki attacks - he'll show a more focussed/powerfull expression. Now, you've probably noticed the tiny body, legs and feet. Not only does this give him a more "young boy" look with playful agile moves, but this was actually more a design choice because it is one of Heroki's least important abilities. By giving him a slightly smaller body, the focus would be more directed towards his arms and head which in their part (as described above) have a bigger rol in functionality. 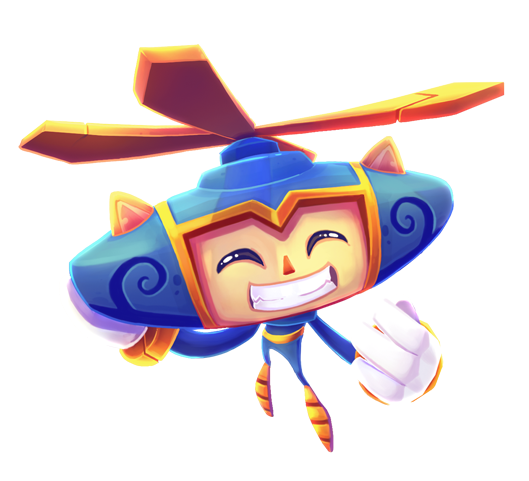 Heroki's basic feature is his ability to fly and while his propeller is something you could describe as 'logical' for flying purposes, he could just as easily carried a jet-pack or he could have magic flying powers. We choose the propeller specifically because it has a more simple and playful look. Plus it emphasizes his flight speed by rotating the propeller faster or slower. Besides that, it looks iconic and finishes the character as a whole. And there it is! 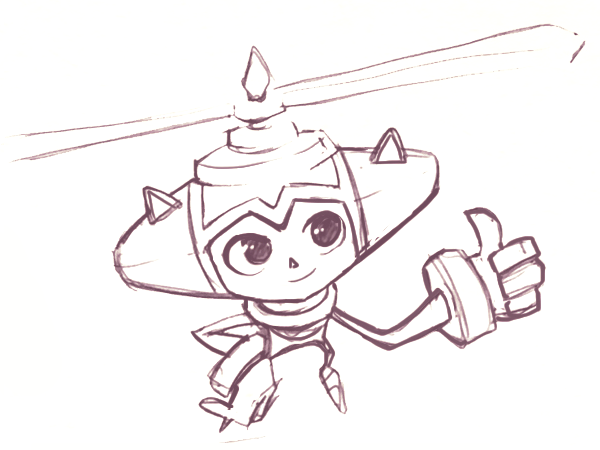 Simple design functionality really shaped Heroki to his final form you see today :). So to be perfectly honest here - we are kinda waiting ourselves to hear an accurate release date since both SEGA and Apple are planning to make it a big thing. That is obviously good news for us but at the same time, we can't answer your question in accurate detail at the moment. When we know more, we'll definitely announce the release date on our blog, upcoming website and trailers! Thanks so much for all your patience though :) We really appreciate the long wait!